Fresh coffee roasted in the Surrey Hills and finely brewed teas, cold drink, shakes and home-baked cookies plus a menu of light lunch and tea time bites, sandwiches to have or for on the go, and delicious homemade cakes. The Cookie Bar provides an environment for young students with disabilities to experience all aspects of running a business and helps young people in their journeys to become social and economic contributors. 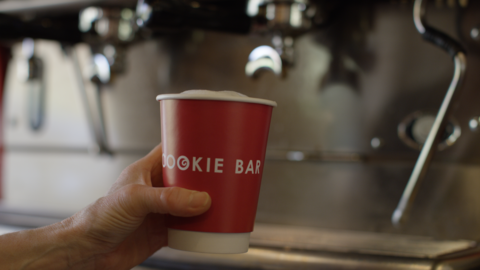 The Cookie Bar launched in 2011 as a social enterprise and was officially opened by the late Lord Joffe, patron of COINS Foundation. The Cookie Bar is part of a vision for positive social change and is part of a much wider group of social projects supported by COINS Foundation. The social enterprise is dedicated to creating change and influencing people to think differently and has a long-term focus on societal change, using profits to look out for the least fortunate in society and setting a trend in the right direction to create a fairer society. Profits re-invested benefit the people and communities they serve, as well as communities of the world that is our home.